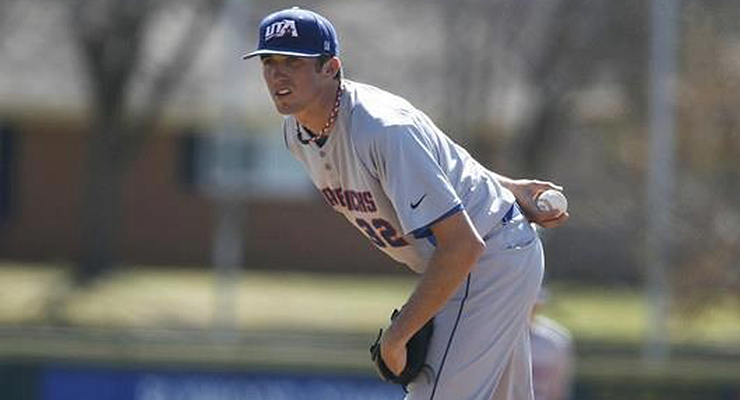 On May 11, Zach Thompson nearly pulled off an incredibly rare feat (photo used with permission from UTA Athletics). On Sunday, May 11, 41,407 fans witnessed the final 2014 appearance of the Boston Red Sox at Globe Life Park in Arlington, Texas – barring a postseason confrontation. I was watching baseball in Arlington too, but I estimate that the crowd was about .01 percent of the Mother’s Day crowd at the Rangers game. The contest I attended was a Sun Belt Conference game between Western Kentucky and the University of Texas at Arlington at Clay Gould Ballpark. The WKU Hilltoppers came into the series with a record of 27-24, while the UTA Mavericks were at 26-25. There was not much to play for at this stage of the season. The conference championship had been clinched long ago by the University of Louisiana at Lafayette, who had compiled a record of 43-7 at the start of the weekend. Curiously, both starters were named Thompson, Zach for UTA and Jake for WKU. UTA had tallied three runs in the bottom of the third, and the score remained 3-0 into the seventh inning. While there was little at stake for the two teams, Zach Thompson was working on a no-hitter. He had benefited greatly from outstanding defensive plays, both infield and outfield, and the official scorer even gave him a break in the third when his second baseman Darren McLemore (son of Mark McLemore) was charged with a tough error. I was poised to mark it down as a hit on my score sheet. It took a while, but eventually an E4 appeared on the scoreboard. I suspect the official scorer struggled with that one, but at that stage of the game, I don’t think he was worrying about a potential no-hitter. Zach Thompson had been lucky, but with two outs in the seventh inning, his luck deserted him. He gave up a walk (his second), then a base hit. The next batter, Hunter Wood, hit a fly ball to right field that barely cleared the fence. That tied the game at 3, and that was all for Zach Thompson. It happens that way sometimes. After one batter, you lose your no-hitter, after the second batter, you lose your shutout and you’re stuck with a no-decision. The consolation prize, a quality start, isn’t terribly consoling. UTA did win the game, however, after scoring twice in the bottom of the eighth. After Thompson was taken out, I was adding up his stats for my score sheet. I was immediately struck by one statistic: Thompson had recorded 20 outs (13 on the ground, seven in the air) without benefit of a strikeout. Of course, a certain amount of luck is always necessary to garner a no-hitter, but when batters continually succeed in making contact, that really defies the odds. One would think that a pitcher who pitches (or flirts with) a no-hitter would likely have a goodly share of strikeouts. The fewer balls put in play, the fewer chances for a hit. The purpose of this preamble is to show how a seemingly insignificant game can provide a thought-starter. To wit, has there even been a major league no-hitter in which the winning pitcher recorded no strikeouts? Have 27 batters ever made contact without recording a safety? Earl Hamilton is hardly a household word today but he had a 14-year career, mostly with the Browns and Pirates, but also briefly with the Tigers and Phillies. Hamilton was a decent pitcher with lousy teams. He finished with a record of 115-147. He had just three winning seasons (13-12 for the Browns in 1913, 6-0 for the Pirates in 1918, and 11-7 for the Pirates in 1922). His 3.16 ERA surely deserved better, even in that era. He retired at age 32. When he pitched his K-less no-hitter, he was just 21 years old. His 139 strikeouts for the 1923 season placed him sixth in the American League. With 5.011 strikeouts per nine innings, he was in eighth place in the AL in that category. His 41 starts placed him sixth in the league. His 249.2 innings pitched was the second highest total of his career. Nevertheless, his record for the year was a mere 11-14. In 1912 the Browns actually finished two games ahead of the Yankees! Unfortunately, the Yankees (their unofficial nickname that season) finished in last place. The Browns finished the season two games ahead of them at 53-101. The Yankees were formally known as the Highlanders in 1912, but that was the last season they used that nickname. In 1913, they moved in with the Giants at the Polo Grounds and from that season on, they were officially known as the Yankees. Under that name, they did not endure another cellar-dwelling season till 1966. Hamilton’s late-summer gem against the Tigers was, in a sense, payback. On July 4, George Mullin had pitched a no-hitter against the Browns. It was the first no-hitter in Tigers history. Hamilton’s no-hitter, unfortunately, was not a shutout. An error by second baseman Del Pratt allowed a run to score in the fourth inning. 2,100 were on hand to witness the contest, which was over in a mere one hour and 35 minutes. Ah, the good old days! Another outstanding effort by Hamilton occurred on July 16, 1920. As a member of the Pirates, Hamilton pitched 16 shutout innings against the Giants, only to be out-dueled by Rube Benton, who pitched 17 shutout innings. Hamilton totally ran out of gas in the 17th and was charged with seven earned runs. So despite his heroic efforts, the effect on his ERA was negligible (he finished the year at 3.24). Mercifully, he was relieved with one out in the 17th. Also interesting to note is that he had but one strikeout in that marathon. For the most part during his career, Hamilton was pitching to contact. In 2,342.2 innings, he struck out 790, just a tad better than three per nine innings. He barely surpassed his career walk total of 773. The Yankees were coasting to their third straight pennant (and third straight World Series match-up with the Giants) in 1923. The big difference was that this time they had their own digs, as Yankee Stadium had opened in April. Their record, as of Jones’ gem, was 81-43. They would finish the season at 98-54. The A’s were still languishing between their first dynasty (which ended when Connie Mack broke up the team after their 1914 pennant), and their second (arguably starting in 1927 with a second-place finish, but for sure from 1929 to 1931, when they won two out of three World Series). The A’s came into the game at 52-70 and would finish the year at 69-83. Jones was a part of the Red Sox exodus that occurred during the reign of owner Harry Frazee. After going 23-16 for the 1921 Sox, he was traded to the Yankees, who were likely disappointed by his 13-13 log in 1922, but he rebounded in 1923. Now 31 years old, he had come into the Sept. 4 contest with a 16-7 record and would go on to finish at 21-8, working both as a starter and a reliever. His career total of 1,223 strikeouts sounds respectable, but Jones had a lengthy career, and not just by the standards of his era. He closed out his career with four years as a member of the White Sox, retiring (with a record of 229-217) after the 1935 season at the age of 43. Despite his quadruple-digit strikeout total, his 22-year career includes not one season when he was in triple digits in strikeouts. His highest total was in 1921 when he struck out 98 in his last year in Boston – but this total was achieved in 298.2 innings, the busiest year of his career. He walked more batters (1,396) than he struck out in his 3,883 innings pitched. In fact, in only four seasons (1920, 1921, 1922, and 1931) did he have more strikeouts than walks (he also had one tie, 60 of each in 1934). So with an average of less than three strikeouts per nine innings, Jones would never be mistaken for a strikeout pitcher. Given this fact and his lengthy career, one can see that if anyone was going to throw a no-hitter without a strikeout, he was a pretty strong candidate. One curiosity about Jones’ no-hitter: Opposing pitcher Bob Hasty went the distance and notched just one strikeout. So that makes a grand total of 53 contact outs in one game – unusual in any era. It is also worth noting that Jones’ achievement was the first no-hit, no-run game in Yankee history. The first no-hitter was pitched by one George Mogridge on April 24, 1917, but one unearned run denied him a clean string of goose eggs. Another oddity is that the A’s were no-hit again just three days later at Shibe Park by Howard Ehmke of the Red Sox. Ehmke racked up just one strikeout; otherwise, he would loom larger in this article. Ehmke, by the way, almost made Johnny Vander Meer a Johnny-come-lately; he gave up just one infield it in his next start against the Yankees. In a sense, this one was almost over before it started, as Ron Santo hit a three-run homer off Phil Niekro in the bottom of the first inning, and there was no more scoring the rest of the afternoon. This game, played on a Tuesday afternoon, attracted an overflow crowd of 37,514. This was the year the Cubs, leading the Eastern Division of the NL, appeared to be headed to their first postseason appearance since 1945. This was the first year of divisional play in the National League and the Braves were one of the contenders in the Western Division (of course, Chicago is far to the west of Atlanta, so the divisional assignment of the teams would appear to defy geography), so the series with the Cubs was possibly a preview of the NLCS. The Braves showed up for the NLCS but the Cubs did not, for this was the year of the Miracle Mets (who were 66-51 at the start of the day on Aug. 19, compared to the Cubs record of 76-45). But on this day, all went well at Wrigley. Holtzman, relying mainly on his fastball, had to overcome a lineup that included Felipe Alou, Hank Aaron, Rico Carty and Orlando Cepeda. Given the Cubs’ status at that point of the season, the size of the crowd, and a no-hitter in the making, I think one can safely assume that Wrigley was wreally wrocking in the late innings. There haven’t been many left-handed Jewish starting pitchers in major league history, and Holtzman’s first full season coincided with Sandy Koufax’s final year – namely 1966. Obviously, the scribes sniffed out the theme inherent in that situation…the passing of the torch…the young warrior donning the mantle of the fallen (well, prematurely retired) hero…could Holtzman succeed King Koufax the way Solomon succeeded King David? Well, King David was a tough act to follow, but so was Sandy Koufax. Holtzman was no Koufax, but he did have a distinguished career of his own, particularly during the postseason with the Oakland A’s. He started five games in the ALCS from 1972-1975 and came away with a 2.06 ERA; in the world Series from 1972-1974, he started seven games and had a 2.55 ERA and four victories – the same total as Koufax, though the latter had a gaudier ERA (0.95). During the regular season, Holtzman compiled a 174-150 record in 15 years. Note that he had nine more victories than Koufax, so that makes him the all-time left-handed Jewish leader in wins! But with 1,601 strikeouts in 2,867.1 innings, he was not mowing ‘em down like Koufax, who struck out 2,396 in 2,324.1 innings. In Koufax’s four no-hitters (June 30, 1962 against the Mets; May 11, 1963 against the Giants; June 4, 1964 against the Phillies; and Sept. 9, 1965 against the Cubs) he racked up 43 strikeouts, averaging slightly more than 10 per game. So in that respect, Holtzman’s no-hitter was a very un-Koufax-like performance. Like Koufax, Holtzman appears in the list of pitchers with multiple no-hitters. In his second no-hitter (against the Reds on June 3, 1971), he did get six strikeouts. Well, in looking at a complete list of major league no-hitters, there is no shortage of pitchers who would never be classified as world-beaters. The number of strikeouts in each no-hitter is variable. Some pitchers had a lot, some had few, many were in-between. But when you step it up to pitchers with multiple no-hitters, it is a different picture. Among those who have two no-hitters are the great (Hall of Famers Jim Bunning, Pud Galvin, Christy Mathewson, Warren Spahn, and likely Randy Johnson) and the merely good (e.g., Mark Buehrle, Steve Busby, Carl Erskine, Allie Reynolds, Hideo Nomo). When you bump it up to three no-hitters, the club is more exclusive. There are only three members: Larry Corcoran, Bob Feller, and Cy Young. Feller, of course, was a renowned strikeout pitcher. If not for World War II, he might have had more than three no-hitters. Cy Young, however, started 815 games in his career. Given that formidable workload, it’s not terribly unusual that he would pitch three no-hitters. His strikeout total (2,803) is not that impressive given his 7,356 innings. The third, Corcoran, is perhaps the most intriguing of them all. Standing just 5-foot-3 and weighing 127 pounds, Corcoran had five highly productive seasons for the NL White Stockings. From 1880 to 1884, he started 255 games. He notched 1,103 strikeouts in 2,392.1 innings, hardly the mark of a strikeout pitcher. That five-year workload took a toll, and arm problems all but ended his career. He lingered for several more seasons, notching just seven more victories before retiring. His damaged arm, however, was the least of his health worries, as he died of Bright’s disease at age 32 in 1891. Koufax was ahead of all of the aforementioned with four no-hitters, but we’ve already discussed them. Had he not been forced to retire, he might have gotten more. Even so, he would have been hard-pressed to match or beat Nolan Ryan with seven no-hitters. In Ryan’s no-hitters, he struck out 94 batters. That’s 13.4 per game, roughly half of all the outs recorded. I don’t think it’s an accident that Ryan is the all-time strikeout leader and also the all-time no-hit king. An even more telling statistic can be found in the list of “Pitchers with most no-hitters broken up in innings 7-9.” (Yes, Baseball Almanac actually keeps track of this.) In this list, Ryan had 24 such games. Randy Johnson is a distant second with 11. So it is obvious why Ryan put so many people in the seats, home and away, when he pitched. Fans knew their chances of witnessing a no-hitter were about as good as it gets. As Hamilton, Jones and Holtzman proved, on a given day, if all the stars are in proper alignment, you can pitch a no-hitter without striking anyone out. Numerous other pitchers have thrown no-hitters with modest strikeout totals. But if you have ambitions of pitching multiple no-hitters, it helps if you stick around for a couple of decades or so, as Cy Young did (22 seasons), or if you’re on a roll, as Larry Corcoran was (170 victories in five seasons). But it really helps if you’re good at racking up Ks, as Koufax and Ryan were. Like Young, Ryan had longevity on his side; he pitched for 27 seasons. In the 45 years since Holtzman’s non-K no-hitter, 110 no-hitters have been pitched at the major league level. In each of them, at least one batter went down on strikes. I guess you could say we’re due for another one, but I’m not holding my breath. I have no idea if Zach Thompson realized how close he was to an exceedingly rare achievement, but I tip my hat to him for what he did achieve…and for bringing the subject to my attention. Wow just wow. Never though of that possibility before. Great to know its happened. Any idea about pitch count for Holtzman? It’s said that the best out is one pitch, so how did that work out for him? Let’s not forget one other thing…the wind was blowing IN that day. Had it not, Holtzman would have lost the no hitter AND the shutout…Hank Arron hit one that stayed in the park that was sure a homerun! Atlanta is farther west than you think — farther west than Detroit. It’s east of Chicago, but the difference is not nearly as you describe it. Cool article. I remember reading that Glavine once got 27 outs, with none via strikeout. However he gave up a hit or two (maybe even some runs). Might be cool to expand the search to include those games as well (if they are as rare as I think they could be). Article update: Zach Thompson has been selected by the White Sox in the 2014 draft.